Walk slowly for the first 5 minutes and allow your muscles to warm up. It is important to allow the muscles to warm up to prevent injury. After a 5 minute warm-up, increase to a brisk pace and keep this pace until 5 minutes before you are finished. 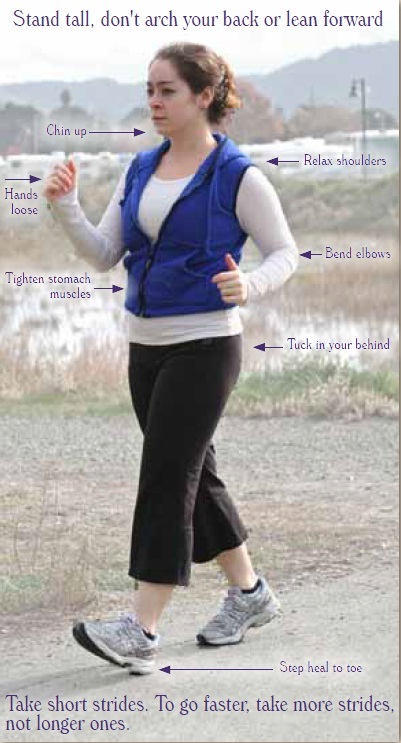 About 5 minutes before the end of your walk, reduce your pace and incorporate stretches. It is important to stretch when your muscles are warmed up to reduce the risk of injury. Reduce your pace 5 minute before the end of your walk (as stated above) to cool down, and incorporate stretching. Breathing should become more steady. Stopping an exercise without cooling down may result in dizziness or discomfort.